How was your weekend? I have to say I had one of the best weekends. Friday night I hosted a small dinner party where I made (deconstructed) paella, tapas, and a build your own sundae bar for dessert —will post about the dinner party soon. On Saturday night we grilled pizzas and the neighbors popped over to share dinner and stories —will post about the grilled pizzas soon too. Then on Sunday my darling Penelope had her very first dance recital which was so adorable. Delicious food, visiting with wonderful friends and family, beautiful weather, a lovely thunderstorm, and watching my daughter on the stage for the first time was soÂ joyous. So to continue on the joyous high from the weekend I thought the perfect recipe to share would include sprinkles. Sprinkles = happiness, don’t they? If not they should. 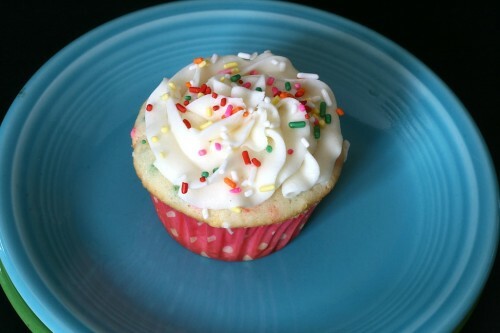 Funfetti cupcakes have been a birthday favorite since I was little. The spring seems to be a popular baby shower/bridal shower season and funfetti cupcakes would be the perfect addition on the dessert table. The best part of making homemade funfetti cupcakes is that you can pick the color of your sprinkles. I went with a multicolor sprinkle since I wasn’t making these for any particular event. Baby gender reveal parties seem to be a thing –what about using all pink or all blue sprinkles in these cupcakes? For bridal showers you could use the bride’s wedding colors. Use school colors for graduation cupcakes. 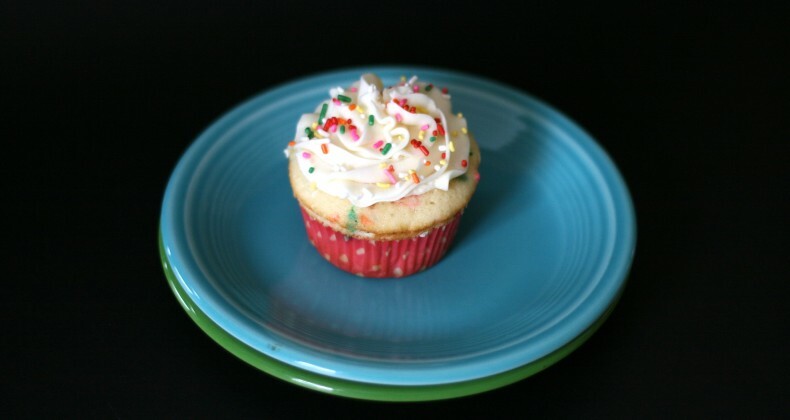 With the endless sprinkle colors you could make funfetti cupcakes for every event and have coordinating sprinkles. Preheat oven to 350 degrees F. Place cupcake liners in a muffin tin. In large bowl mix together flours, baking powder, salt. Set aside. Whisk together buttermilk and egg whites. Set aside. In mixing bowl beat sugar and butter together. Until well combined. Mix in vanilla. Alternate adding 1/3 of flour mixture and 1/2 of buttermilk mixture to mixing bowl, beating until just incorporated in between (begin and end with flour mixture). Beat for 1 more minute. Fill cupcake liners 3/4 full. Bake for 18-20 minutes, until cupcakes spring back when lightly touched and a toothpick inserted in the middle comes out clean. Add the meringue powder and water to your mixing bowl. Then using your whisk attachment for your mixer whisk the heck out of them on medium high speed for 8-10 minutes or until the egg whites form stiff peaks. Bump the speed down to medium and start adding the butter 2 T at a time making sure each addition is incorporated before adding any more. At this point your mixture may start to look soupy and/or curdled. Donât be alarmed just bump the speed up to medium high and keep on mixing until it smooths out (maybe 5 minutes). Once all the butter is incorporated bump the speed down to low and slowly add in the powdered sugar. Be careful as the powdered sugar may fly up in a dust all over your kitchen. Once the sugar is stirred in increase the speed to medium high and mix everything together. Slowly add the vanilla and mix for another minute or two. At this point you can add any food coloring to the frosting if desired. Use your frosting immediately or put into an air tight container and refrigerate (up to 3 days). When youâre ready to use it bring it to room temperature and whip it using your mixer. These look great! 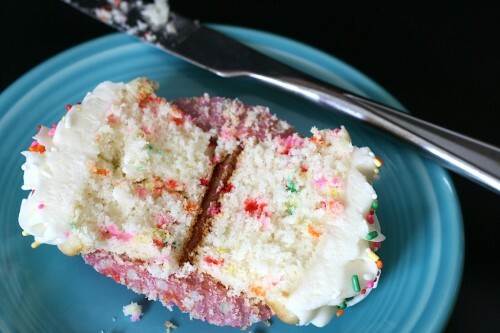 I’m a funfetti fanatic so I love this beyond! I’m really excited for that grilled pizza post. My weekend was busy, so is the beginning of this week.. looking forward to sleeping in Friday!